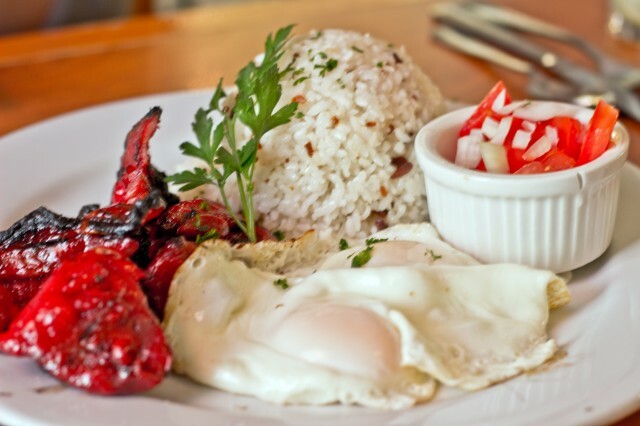 When it comes to Filipino food, there isn’t much selection in Los Angeles. Though more than most cities, my go to Filipino restaurants are slim to none. 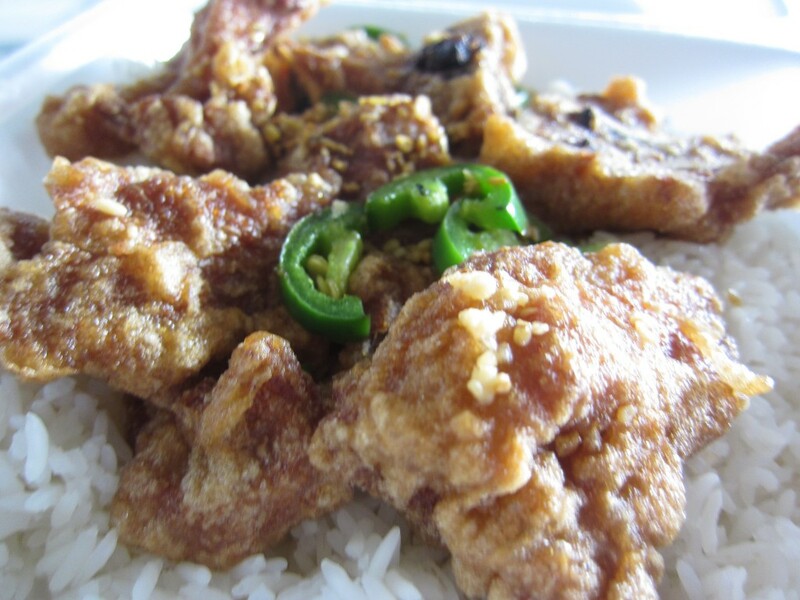 You have Max’s, though very much a chain, still produce pretty good fried chicken and traditional dishes. One little gem I found in Hollywood is LA Rose Cafe. It is a not so small, not so big Filipino restaurant that doesn’t look like one on the inside or outside. The name hints a small breakfast joint, and the inside looks somewhat like a hotel lobby. The food though, was classic and hit the spot. To me, tocino and garlic fried rice is comfort food. 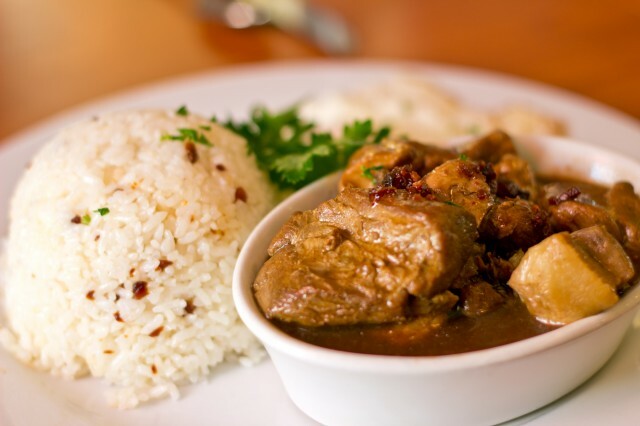 Though I didn’t grow up in a Filipino home, I still had meat and rice almost daily. The sweet caramelized port goes so well with the garlic rice. The tomato and onion vinegar slaw helped cut down the richness of the pork so perfectly. I just wish it had eggplant in it as well. The egg, mixed in with the rice was a perfect “breakfast” component. This was classically prepared and oh so delicious. For our “lunch” portion, I had the classic pork adobo. I remember as child, my grandpa would make this whole vat of chopped up pork bits, simmering in a bath of soy sauce and sugar. The end result was a seemingly endless amount of pork and rice. This dish was just like that. The pork wasn’t dry at all form the long cooking process. It kinda just pulled away from each other. It seemed like it was missing something. This dish did need a Korean element — kimchi. 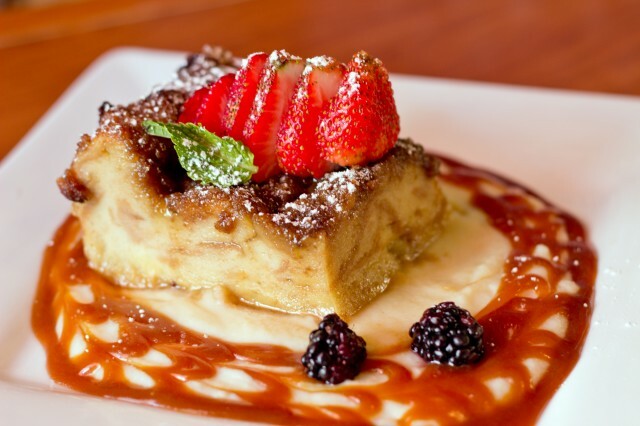 As a treat, we finished off with their bread pudding. This was an impressive and delicious bread pudding to say the least. It was perfect! Soft custard inside, nice crisp crust outside, caramel all over, and strawberries on top – scrumptious. Did I also mention, no raisins FTW! With each bite, I made sure to have some caramel on it. Instead of having whipped cream as the “lube”, it sat on top of a pool of pudding/custard. It was all so sweet and wonderful. 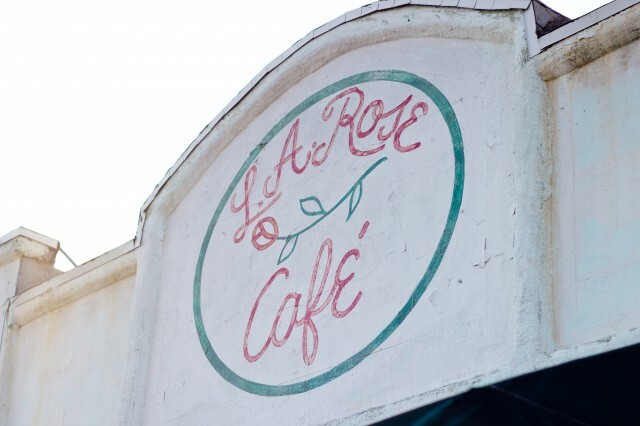 LA Rose Cafe was affordable, and the experience was just pleasant. The servers were so nice and friendly and I just felt comfortable. The decor and design of it all needed a little updating, but I think it gave it a nice charm. I am a sucker for meat and rice, and LA Rose Cafe gave me what I wanted. What can I say about Koreatown? In fact, what good things can I say about Koreatown? I can’t really think of anything, sadly. It’s dirty, over populated, and it’s pretty much the “New Jersey” of Los Angeles. 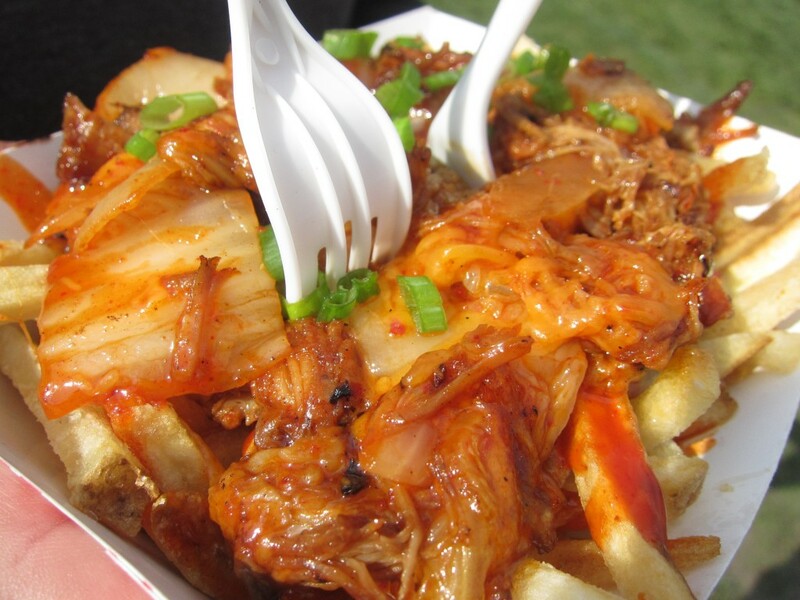 As a Korean American, I grew up eating and breathing Koreatown. My parents, like almost all Koreans, do business here have some sort of connection to Koreatown. One great thing about Koreatown is the Korean food. With Korean BBQ joints on every corner and every other Korean food you can think of, its available. 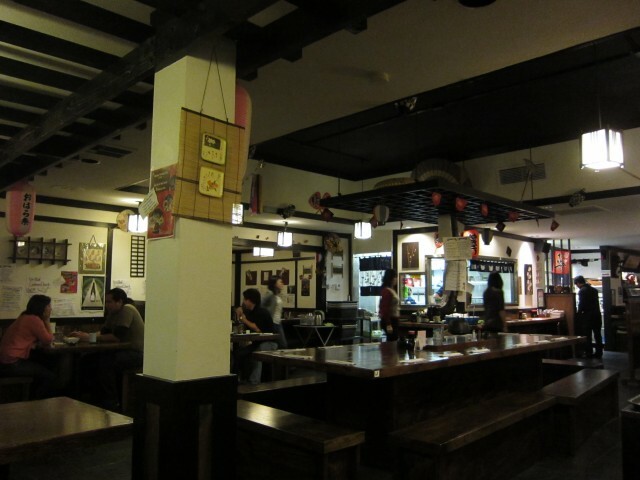 One of my favorite places to get bossam is Kobawoo House on the corner of 7th and Vermont. The food is great, and every single patron gets the bossam. 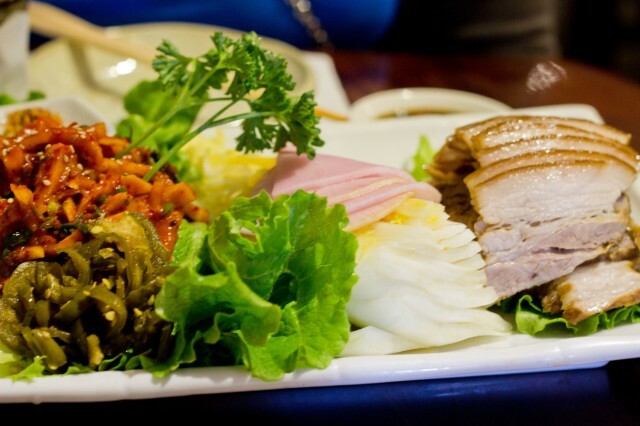 Bossam is steamed or boiled pork that is wrapped in leaf vegetables. 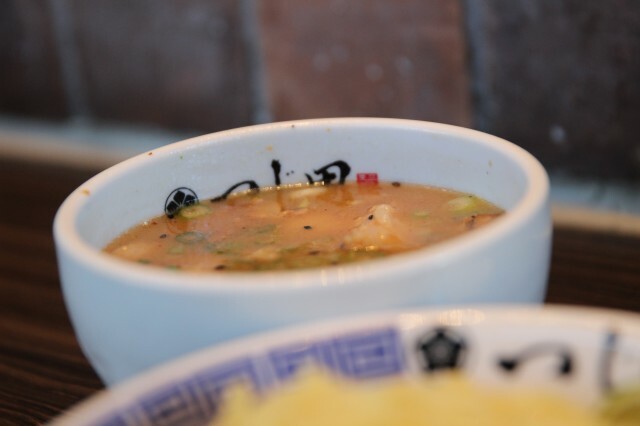 It is often topped with a fermented bean paste or marinated tiny shrimp or kimchi. Sometimes (most times) I get a craving for bossam, and this is the place to get your fix. 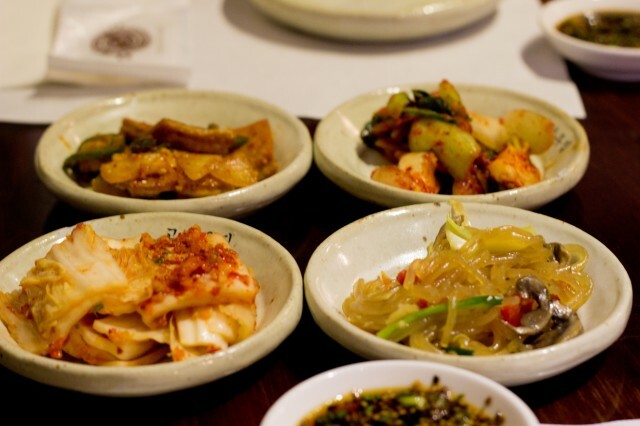 Before we got our bossam, we were given some side dishes (banchan). We had some stir fried sweet potato noodles (japchae), 2 kinds of kimchi, and fishcake. I never know if the side dishes are supposed to be eaten with the meal, but I always treated it as an appetizer. I always go for the kimchi. The noodles were perfect, but never as good as my mom’s japchae. The bossam came in thin slices, stacked on top of each other. 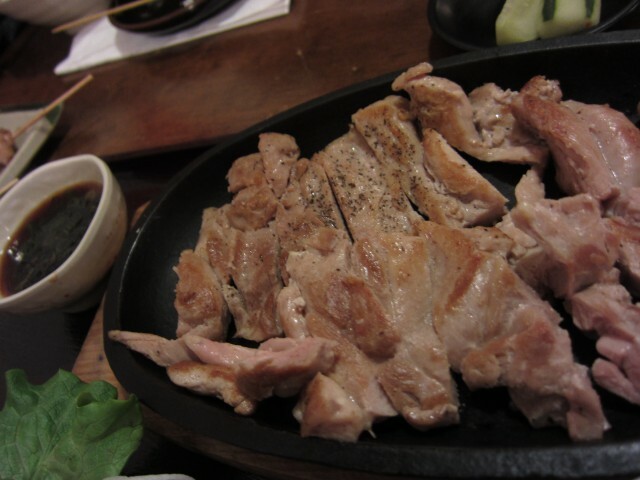 The pork taste was mild and the skin was gelatinous and soft. 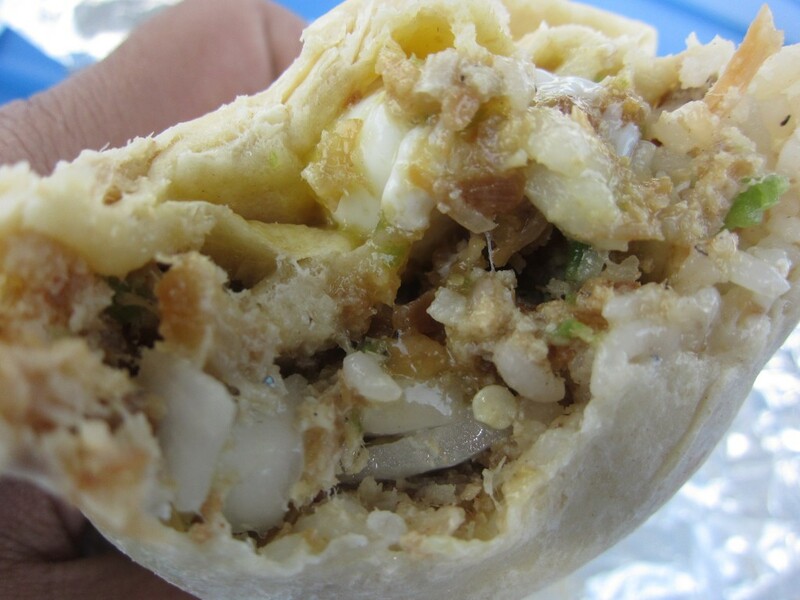 Wrapping it in their perfectly picked Napa cabbage, the morsel of food is perfect in itself. 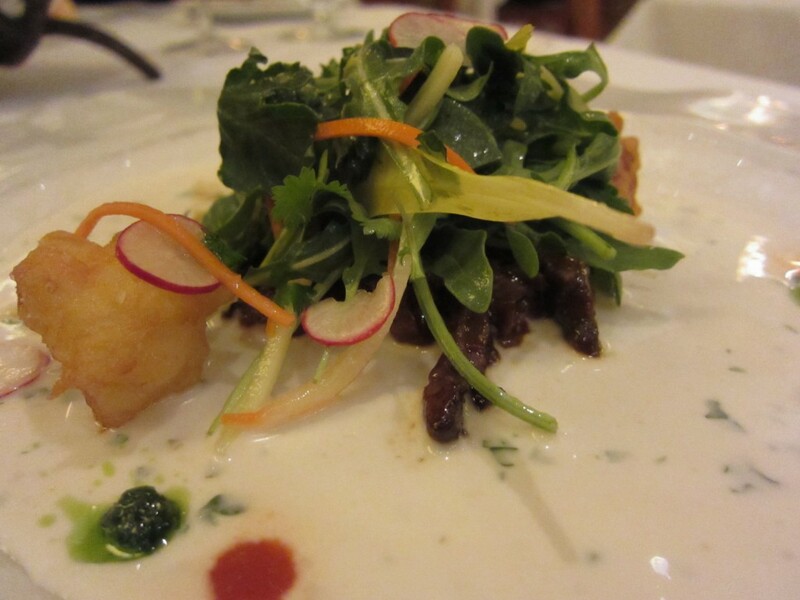 The toppings of the salty shrimp and the dried and marinated radishes gave it a nice spicy flavor. The salty shrimp and pork made a good combination, and the dried marinated radish gave it a nice crunch. To top it all off, I added their soy sauce marinated jalapeno peppers to give the bite some needed heat. Wrapping the whole thing together was a huge amount of food, but I managed to fit the whole thing in my mouth. I would try biting it in half, but the Napa cabbage doesn’t break off too easily. Plus, fitting the whole thing in your mouth and eating it is the Korean way. There is no shame in that. A bite of their pink pickled radish to cleanse the palate, and I was ready for another. 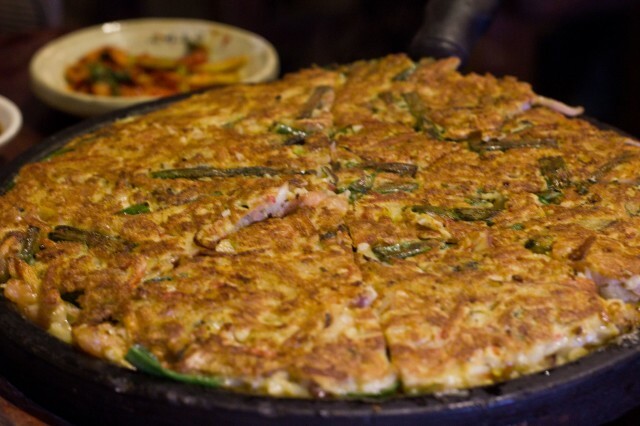 Another item I ordered was their seafood pancake (Haemul Panjun). The sizzling seafood pancake had a mixture of scallops, shrimp, oyster, squid, clams, and green onion. The whole thing was mixed with flour and cooked on a skillet. It was sliced like pizza into 6, and served. After one, I was tired of it. The pancake was thick and dense. The mixture of the seafood was good, especially dipped in the vinegar, green onion, and soy sauce mixture. If it weren’t for this, this wouldn’t have been even considered. I should have ordered the cheaper and smaller kimchi pancake. It would have suited the bossam a little better. In hind sight, I would have foregone the seafood pancake. 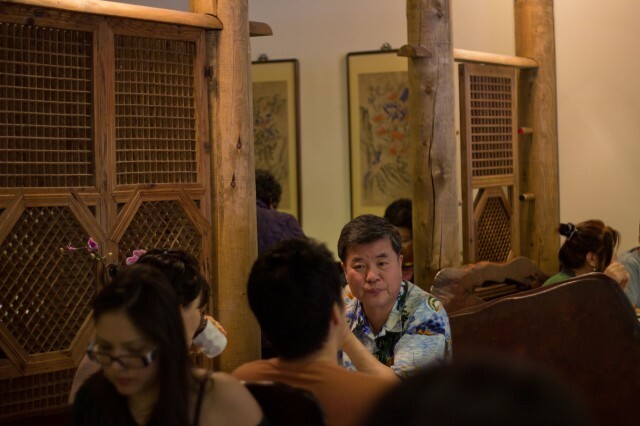 Kobawoo House is a popular spot in Koreatown — there’s usually a wait during lunch and dinner. 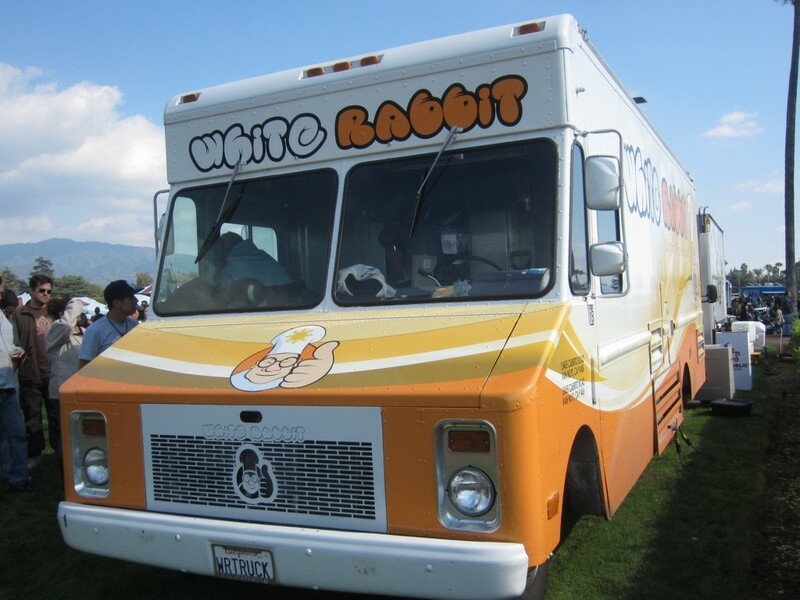 I remember seeing them at the LA Weekly Pancake Breakfast and trying their Korean style pancakes. It was really good, and knew their pancakes were not even specialty. Honestly, Kobawoo House is the place to get bossam. Maybe you can get the Korean style pancakes, but really, its all about the bossam. 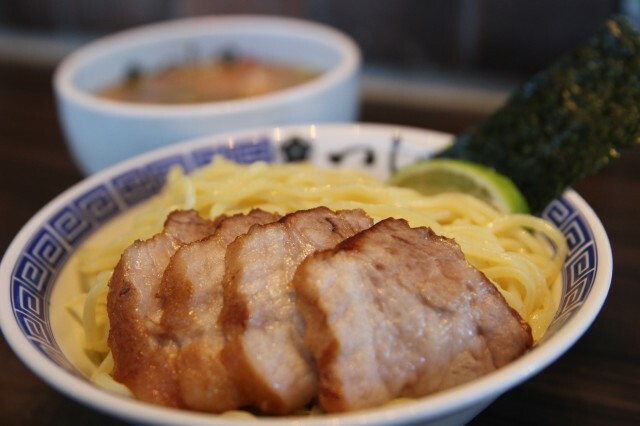 Other places are good, but the pork at Kobawoo is sublime and the small details in flavor are unmatched. I can go for some right now. 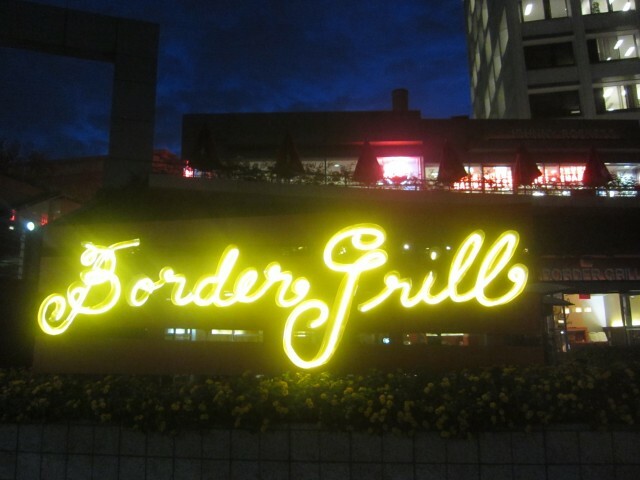 I always pass by Border Grill on Figueroa on a daily basis. Right across from the Bonaventure Hotel, where Bona Vista Lounge and L.A. Prime is, this corner of Figueroa and 5th street always reminds me of these restaurants. Border Grill though, was always a “must” whenever I passed by, and I can’t tell you how many times I thought of just stopping right in front, sitting down, and ordering something. All I needed was that push from Border Grill to make an appointment. To start off, we had chips and salsa. 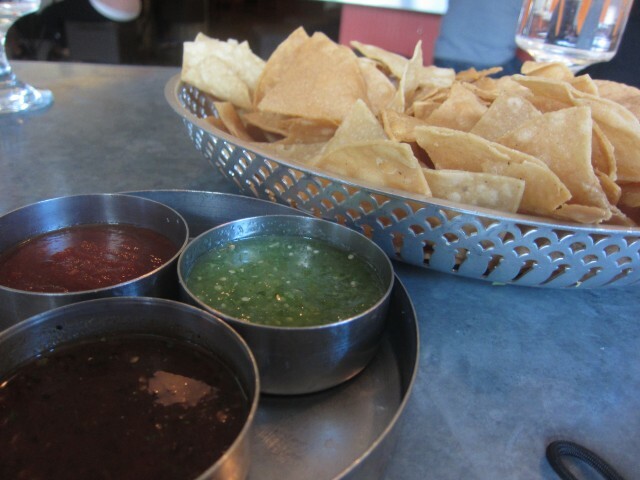 The chips light and airy, and the salsa was fresh. My favorite was the mole salsa. It had a nice complex rich flavor. The Yucatan pork was interestingly delicious. 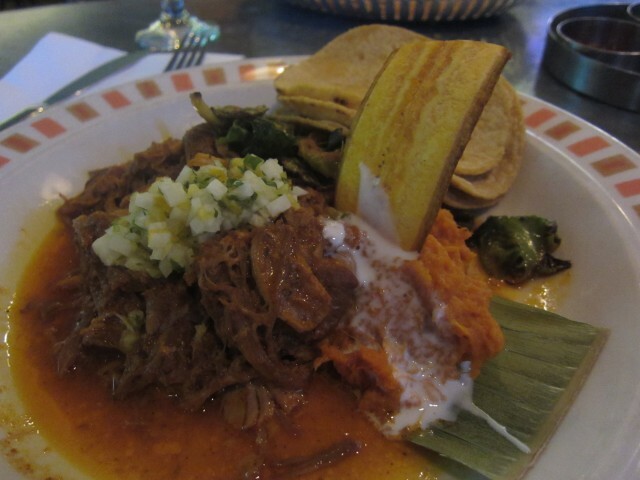 The achiote pork was slow roasted in banana leaf with a mixture of caramelized onion and orange. Sitting on a plate of cinnamon honey lime yams, the sweet and savory factor worked. The pork was succulent and the yams were smooth. The caramelized brussel sprouts were a bit odd on this plate. I felt like another green would have suited this dish better. I did like the pineapple jicama salsa on top for that added crunch. Eating these with tortillas made me really full. A side of rice would have been lighter and would have complimented the dish nicely. 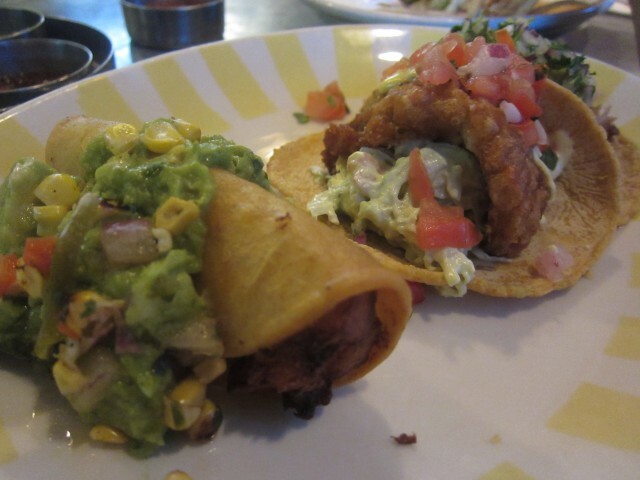 It was happy hour, and the beer-battered sustainable fish tacos were quite impressive. Topped with an avocado crema and salsa fresca, the fried fish was offset by the cool avocado and salsa. The other taco, carne asada was good too. 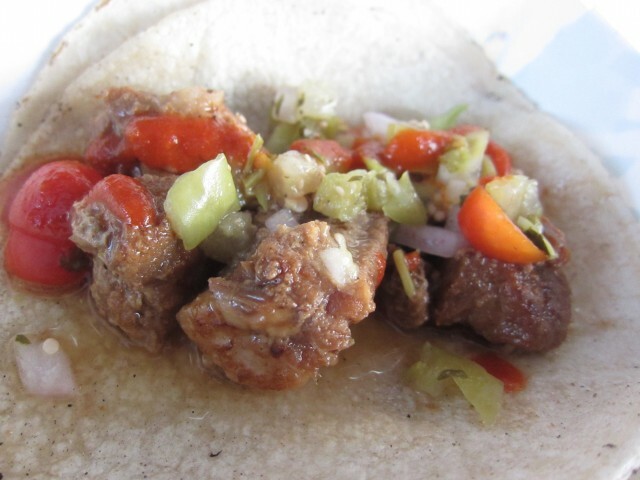 Topped with caramelized onions, salsa fresca, and guacamole, it was like the perfect taco. The beef brisket tacquito was delicious as well. The meat was slow roasted, then the tortilla was fried. Topped with a spicy slaw, guacamole, and salsa fresca, the crunchy fried “taco” was a whole lot better than the ones I get at 7-11. It seems like anything topped with their addicting guacamole was delicious. These tacos were quite impressive, and at $3 a pop during happy hour, it was a great deal! For desser, we had the churro tots. 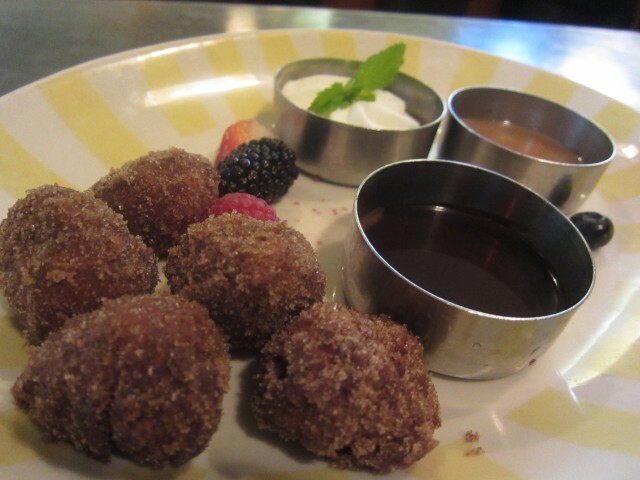 Just by the name churro tots, I had an idea of what these were going to be. I was surprised to find out that these bad boys had dulce de leche infused inside of them. Not only that, but the three dipping sauces of chocolate, caramel dipping sauce, and whipped cream was an added bonus. Not only did these things have dulce de leche inside, and not only did it have a dipping sauce, it also was dusted with cinnamon and sugar, like a churro should. These sugary fritters were incredibly sweet, and a great ending to our meal. “Should I have just went with the happy hour menu?”, is what I thought to myself. In hind sight, I think I should have. 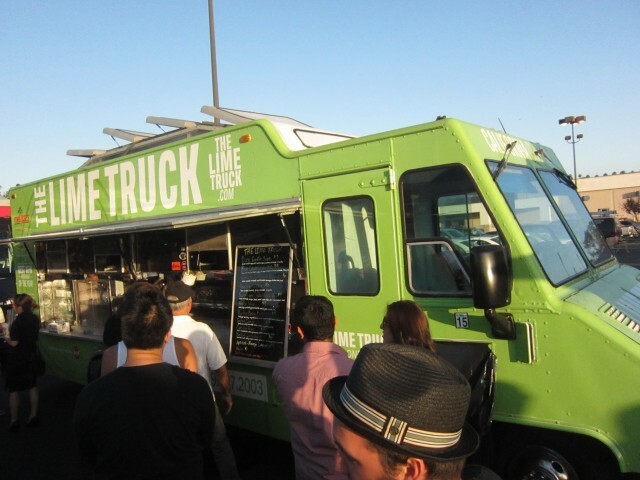 I enjoyed the tacos and the bar food type items. They were cheaper, more delicious, and had guacamole on it. How could I not like that? Honestly, Border Grill is better as a bar. 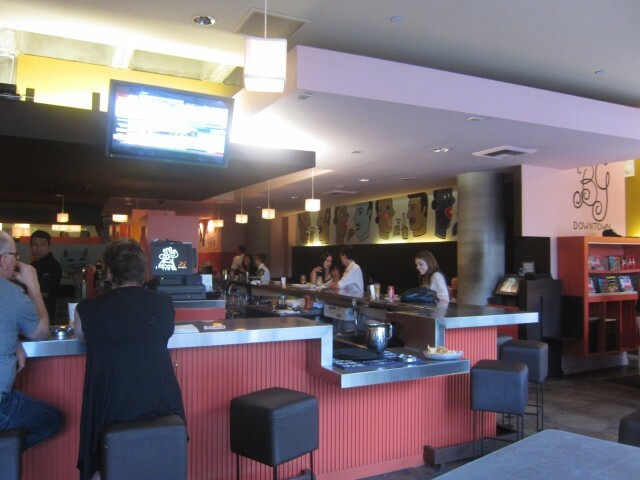 Especially located in Downtown, there were a lot of working professionals gathering here for drinks and good Mexican food. The price is right and the atmosphere is perfectly casual and stylish. I wouldn’t mind coming here more often after work to grab a beer and some tacos. Just don’t forget the guac! When you are in Santa Monica seafood comes to mind. BBQ, let alone, good BBQ isn’t one of the first things you think of. 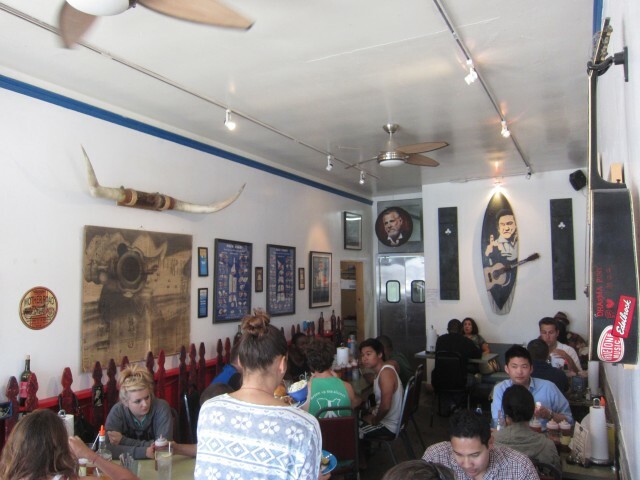 On a random weekend trip to Venice Beach / Santa Monica, I stopped by Baby Blues BBQ. After reading glowing reviews on this joint, I had to see for myself. Just the rarity of a barbecue restaurant near the beach got me intrigued. Situated on Lincoln Blvd., I wasn’t expecting anything gourmet. The rugged interior and simple decor made this place a very casual spot. 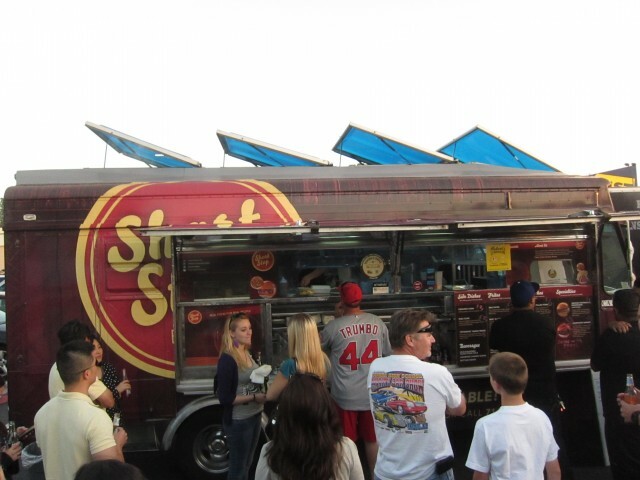 There was a little wait for a table, but the anticipation made me hungry — not a bad thing. I ordered their pulled pork plate. 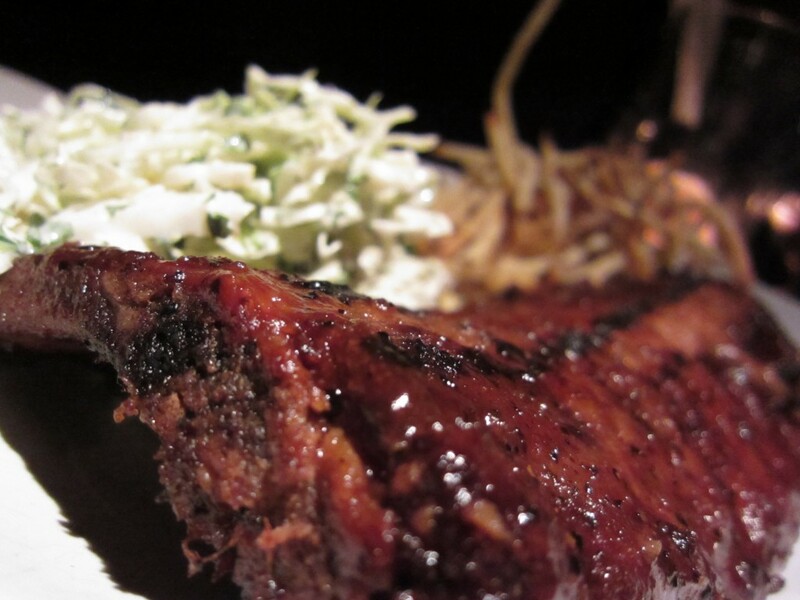 A barbecue restaurant is only as good as its pulled pork. Baby Blues BBQ made some amazing pulled pork. It had the right amount of fat and meat — it was tender and not dry at all. Per their recomendation, we added some of their spicy vinegar sauce on the meat. This brought the dish to a whole new level. The tang from the vinegar went perfectly well with the fatty pork. Slathering the meat with 1 of their 4 sauces was awesome. My favorite was the original. With a side of mac and cheese and mashed sweet potatoes, I was in carb load heaven. The mac and cheese was amazing, hands down. Baked from a large batch, the mac and cheese was rich and cheesy. This was southern cooking at its best. The mashed sweet potato was perfect. A little bit of sweet helped keep my taste buds excited. 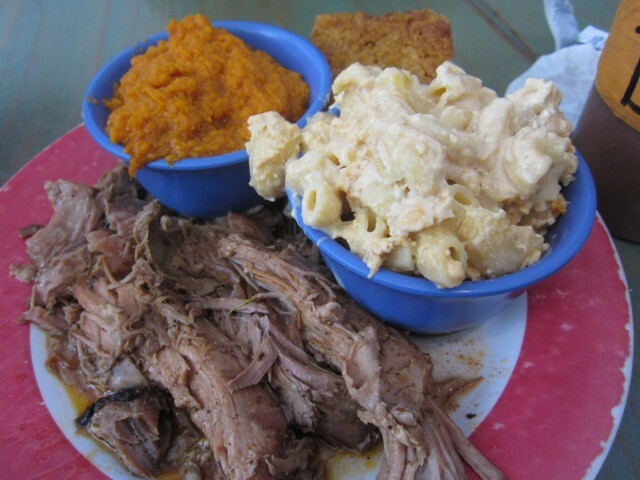 This was a southern style plate that impressed. 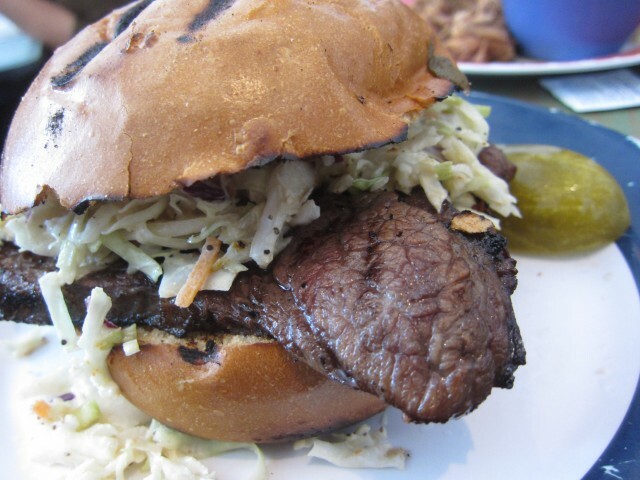 My all time favorite at Baby Blues BBQ is their tri tip sandwich. The meat was a soft and the best part is their marinade. A little sweet and robust like that of teriyaki, the meat had a nice barbecue taste — kind of like an Asian barbecue sauce marinade. The brioche bun soaked up all the flavor and was a perfect vessel for the goodness. The cole slaw on top gave the sandwich enough crunch and texture. I feel good cole slaw is important in a pulled pork sandwich and Baby Blues’ doesn’t fall short. 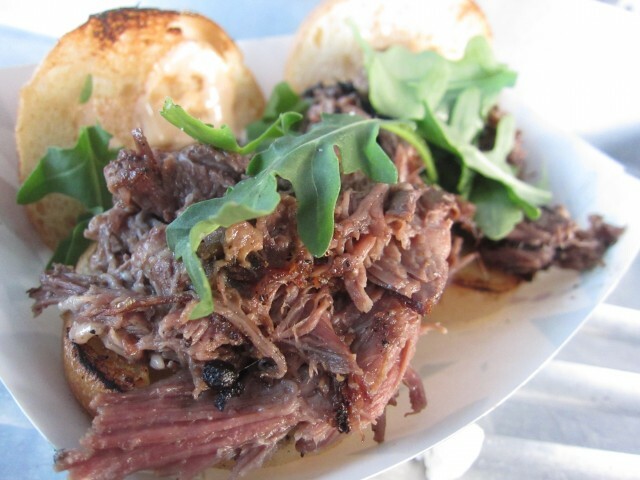 The sandwich was so simple and the tri tip really shined. With a side of a pickle spear and this meal was perfect. 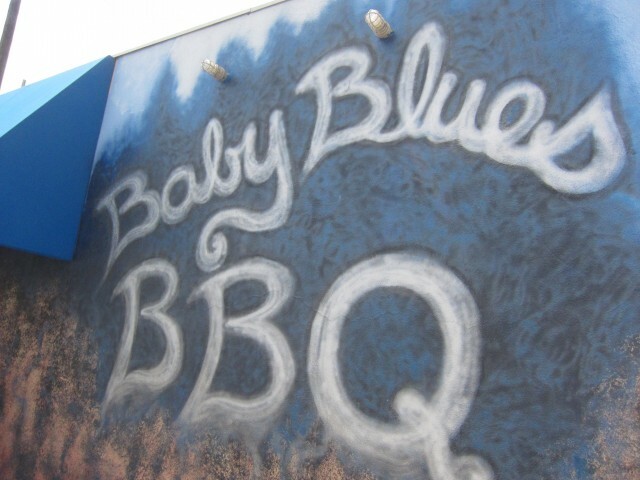 Who would have thunk an awesome barbecue joint would be situated near the beach? Their simple menu and decor really brought them down to earth. 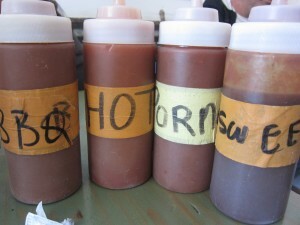 The quality of the meat was memorable and their barbecue sauces were no joke. How perfect was it to eat some great authentic BBQ and then relax at the beach? Something about eating seafood at the beach is so cliche and normal that it doesn’t seem exciting. Barbecue on the other hand is always a win win situation. Adding the beach to the equation just sweetens the deal. 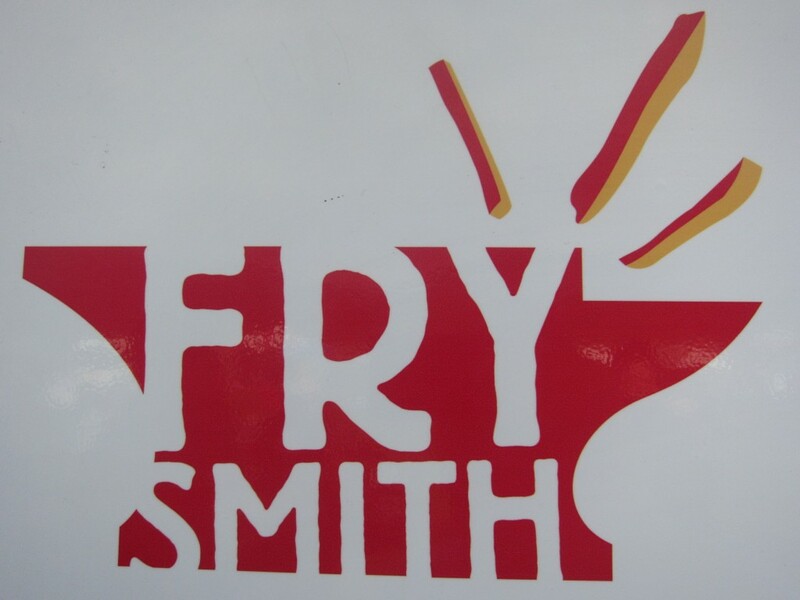 Where have you been to where the food comes out quickly, and is tastier for that? Never. It is safe to say that the speedier the service, the crappier the food. 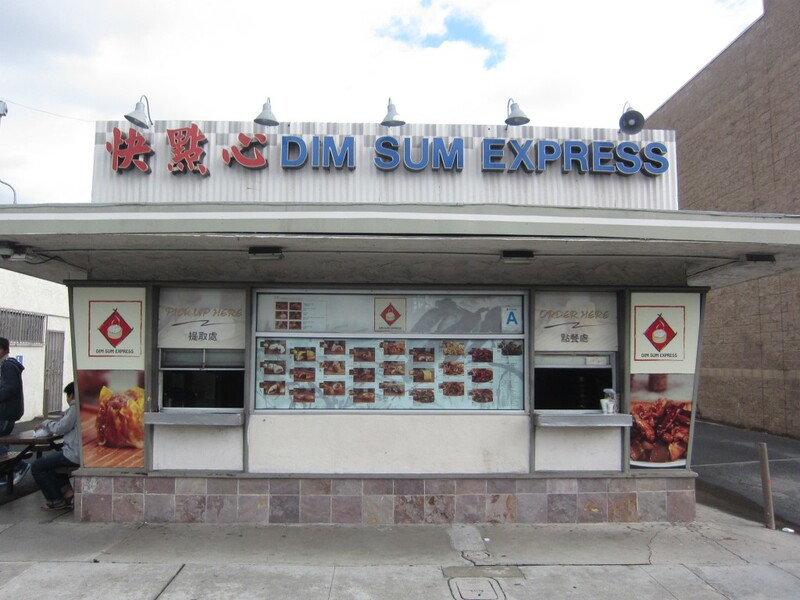 Dim Sum Express is exactly what it is, and is exactly what you expect. 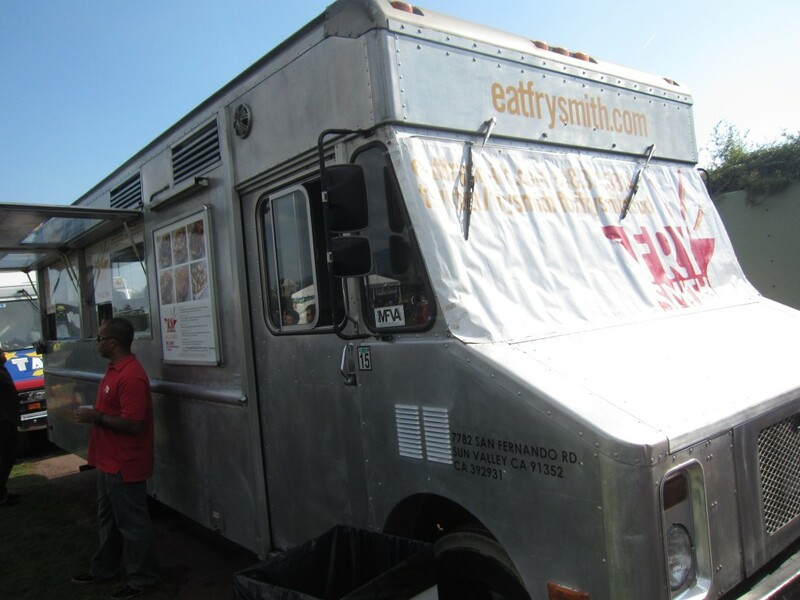 Quick food, which is more convenient than fast, brought to you by a fairly small food stand with a pick up window. The food is alright, nothing great. 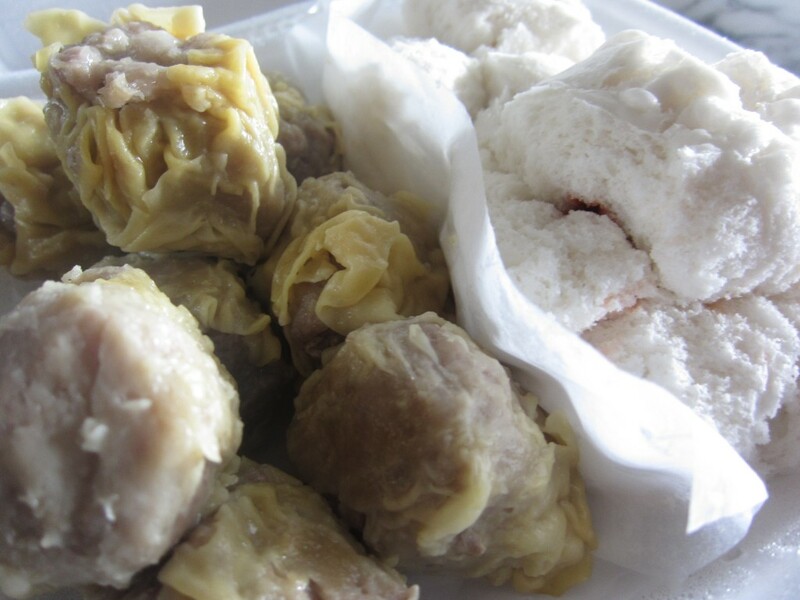 Shui mai is what everyone gets for dim sum. Theirs was nothing special, and to tell you the truth, I expected better. Their bbq pork bun was along the same caliber as well. Maybe it was the “hole-in-the-wall syndrome” where I thought it would be great because of that, but it was mediocre. 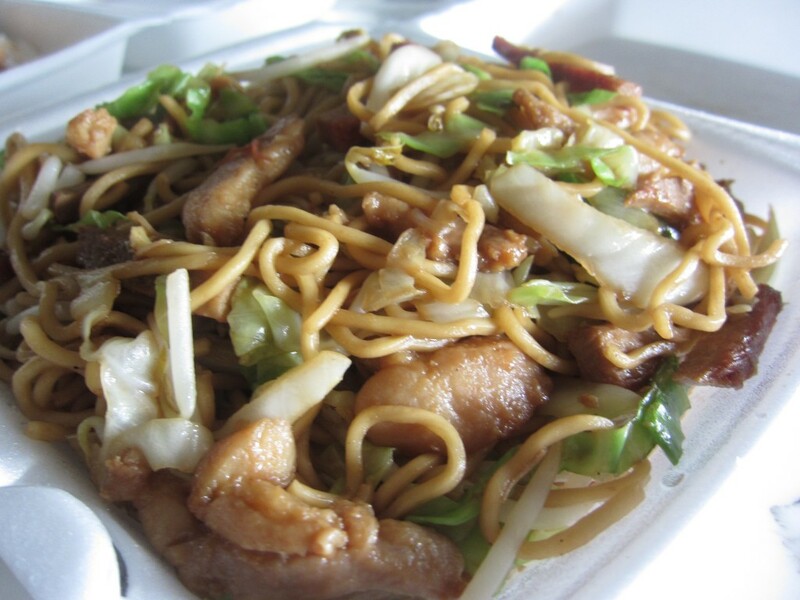 Their combo chow mein was good and plenty but not memorable. Even the fried pork chops were a miss. Though tasty and spicy, the crispy factor of these deep fried slabs was not there. Maybe I ordered everything wrong here, but for whatever it was, my lunch was just not what I expected. I can go to an actual dim sum restaurant and get the same stuff for a similar price. The only difference is, it would be more pleasurable. What we have here is exactly what I mentioned in the beginning. We are paying for the “express”, and not the food. The convenience of just walking up to the window, ordering, and eating is just too much of a sacrifice. I wouldn’t mind waiting a little longer for something much superior to this. I feel like a lot of Japanese restaurants are all the same. 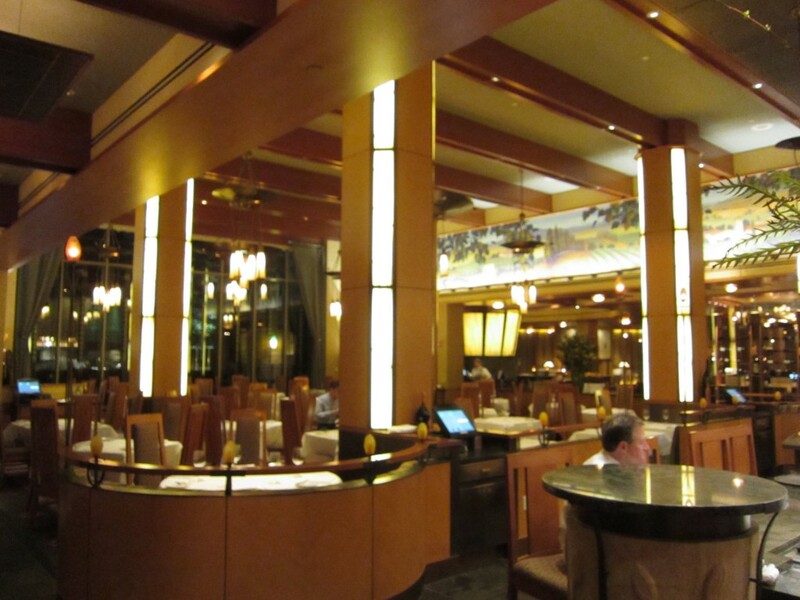 Whether they serve sushi, bowls, noodles, or meats, the interior and feel of the restaurant seems similar. The greeting in Japanese, the Japanese accented props and posters all around the restaurants is all familiar, and comforting. Honda Ya doesn’t only have sushi and bowls, they have everything. I opted for not just one thing, but all of it. Skewers, bowls, sashimi — it was certainly a feast. 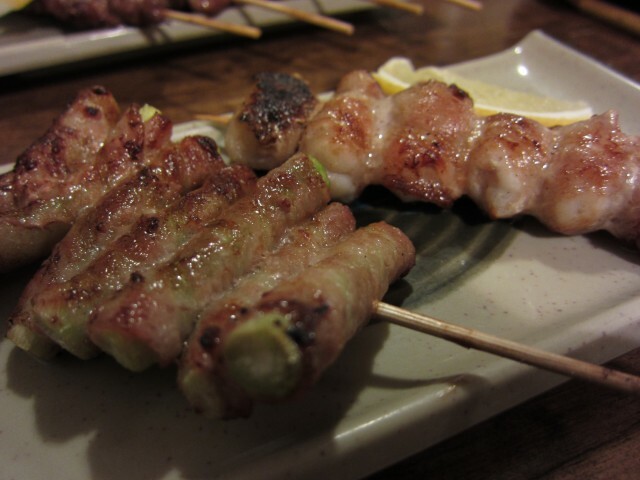 We started off with the skewers — yakitori. Roasted over hot burning charcoal, the taste of grilling was prevalent throughout. The tongue was chewier than expected, but the pork belly was exceptional. I could have easily eaten about a million of those. The bacon wrapped scallops and asparagus was nothing special. Wrapped in a thin layer of bacon, the bacon taste and texture isn’t as pronounced. 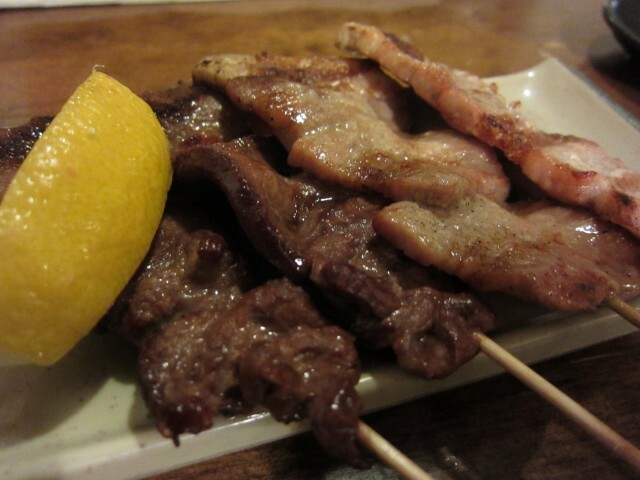 Nonetheless, the skewers were tasty and the charcoal taste was great. The chicken with uzu was a bit of a dissapointment. The chicken was dry, and wasn’t really seasoned (on purpose). We were supposed to dip it in the uzu. The chicken, though on a griddle, came to our table cold. I didn’t enjoy this dish. The sashimi, surprisingly was very fresh. An array of salmon, tuna, and tilapia was laid out beautifully and it was thick and high quality. 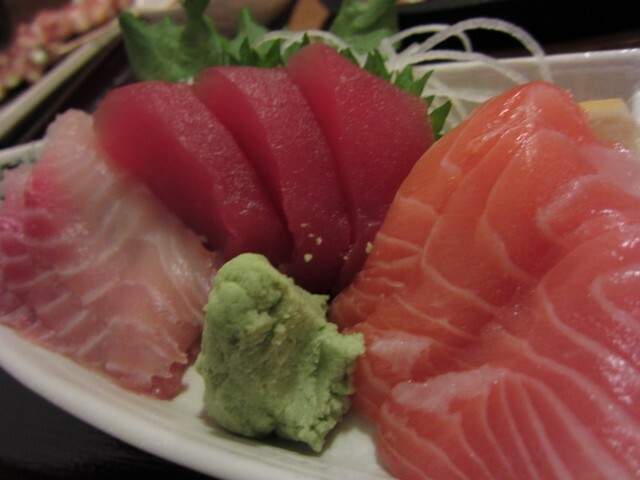 Sashimi is one of my favorite foods, and this just hit the spot. 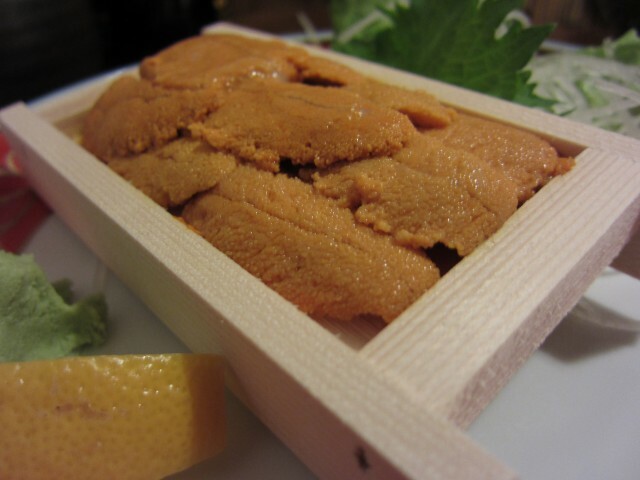 We felt extra extravagant and ordered the uni. 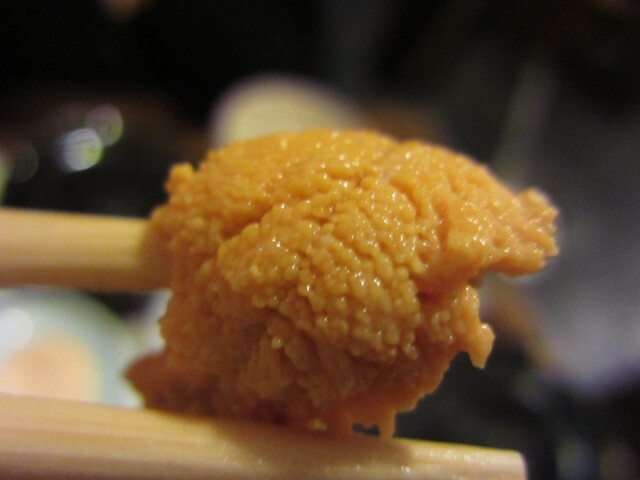 Raw sea urchin, considered a delicacy was definitely a treat. It was sweet and buttery. Eating it with just rice was good enough for me. That seafood rich flavor with the creamy texture was perfect. 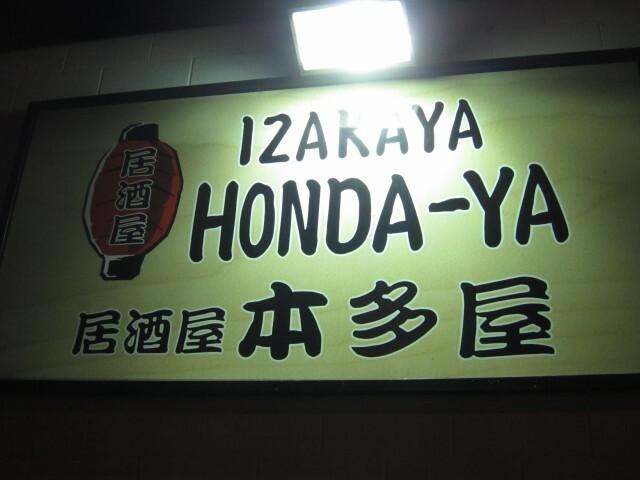 Honda Ya was a great stop. It is open late, though it is located in an obscure area. The service was great and the food items were plenty. 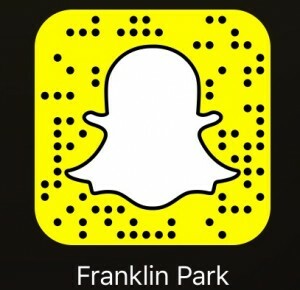 They really do cater to the meat lover, sushi, lover, and everything else in between. 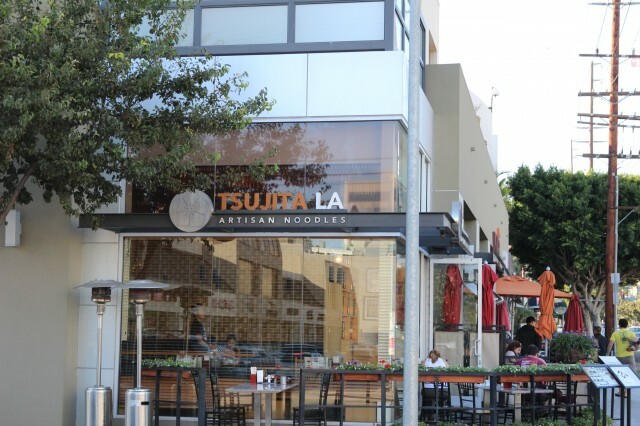 There is also one in Los Angeles and Tustin, which I want to give a try. Until then, the one in Industry will do. 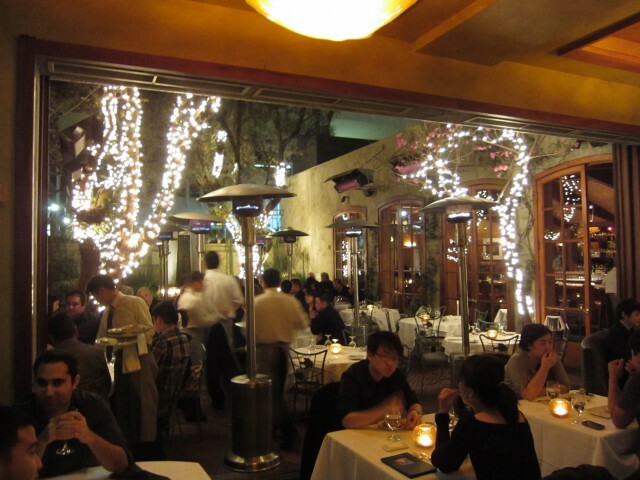 Spago is located in Beverly Hills, amongst some of the most expensive restaurants in Los Angeles — Spago is a local icon. More so, Wolfgang Puck is an even larger icon. As a kid, you always heard about Wolfgang Puck, Spago, and how wonderful of a chef he was. Wolfgang is a celebrity, possibly the most famous chef in the world. The guy has a lot of restaurants, many in Los Angeles and Las Vegas. 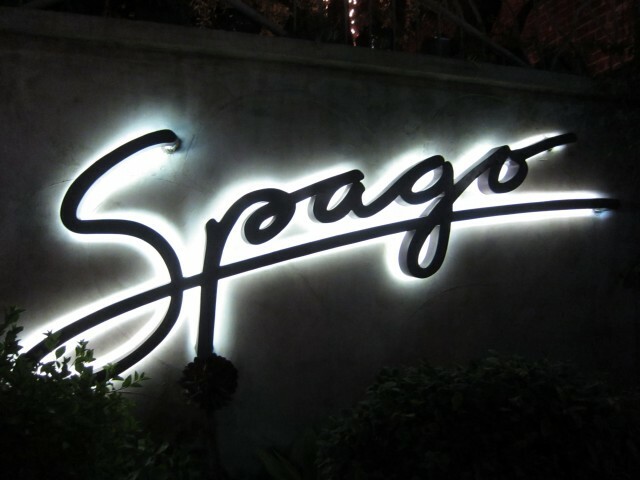 I was glad to see Spago on the list of Dine LA restaurants. Getting a reservation was a battle to say the least. The time was now, and I was honored to have eaten at one of his fine establishments. The dinner I had at Spago will be remembered forever. Now, before you judge me and say that I am hyping up the restaurant, the food had little to do with that. Certain items were spectacular, but something amazing happened that night that I will never forget. Arriving, we didn’t need to wait long. My girlfriend ordered a drink at the bar before dinner. The main floor was adorned with cute pictures and stained glass on the ceiling. The interior was a bit dated compared to the new “hip” restaurants in town, but Spago’s interior design was classic, aged like a fine wine. The outdoor patio was amazingly lit and beautiful. 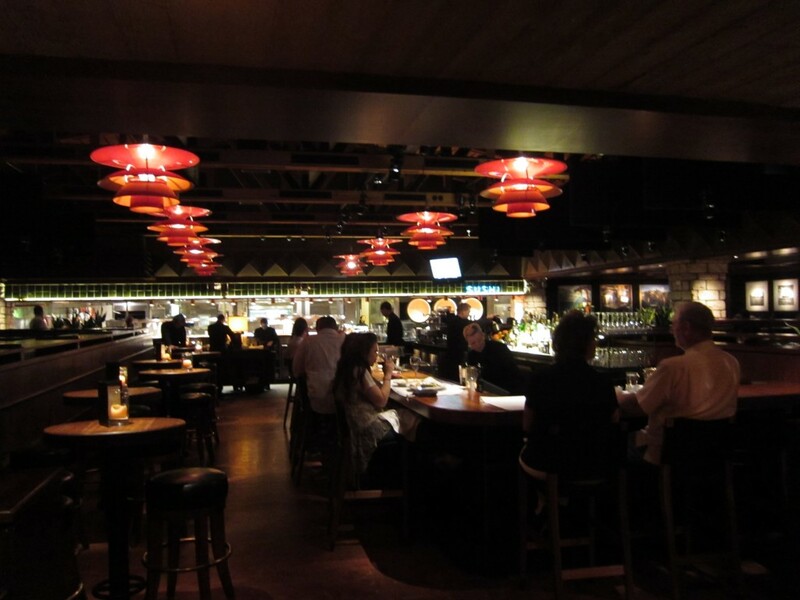 The servers were friendly and accommodating — Everyone said hello and wished us a good meal. It definitely wasn’t a stuffy atmosphere. Bread was served from a tray, and you picked a couple that looked appealing. My favorite were the crisps and the olive bread. This was the beginning of a great meal. Appetizer: Kona Kampachi sashimi. Each bite of the fish was few, but delicious. The crispy rice crackers on the plate tasted like crispy fried pork skin with a hint of sesame oil. The pickled dragon carrots were tart and sweet — it helped cleanse my palate. 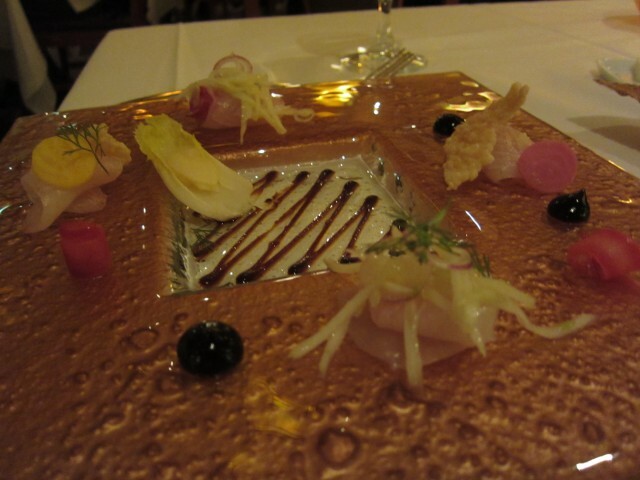 The most interesting was the tosa soy gel and yuzu air. It was a kind of a gelatinized soy sauce. The fish in itself was fresh and pure so it didn’t need much of the sauce. 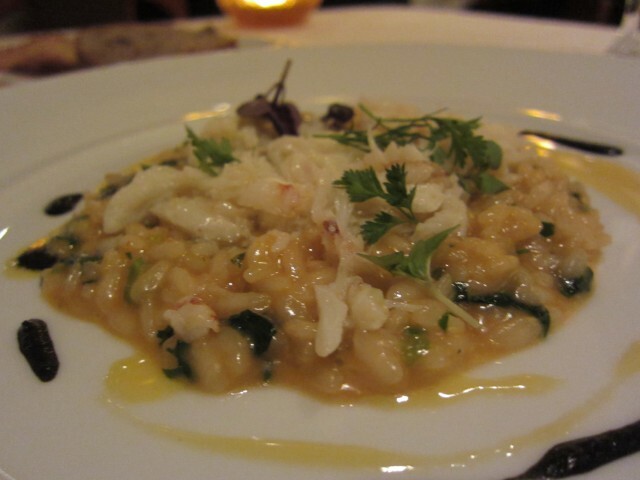 Appetizer: My dungeness crab risotto was a bit off. I couldn’t help but think the texture of the risotto was too grainy. The sauce was also off as it wasn’t starchy enough. Despite that, the Spanish saffron and squid ink vinaigrette tasted very good with it. 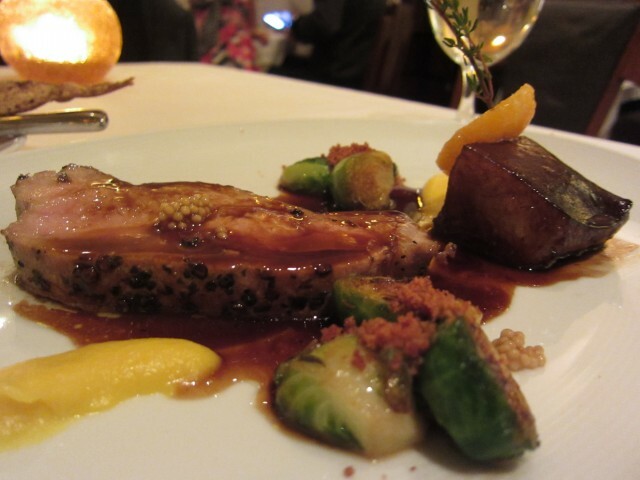 Main: I had the roasted kurobuta pork loin and braised pork belly. It came with roasted brussels sprouts and puree of butternut squash. The pork loin was cooked perfectly, without an ounce of dryness. The sauce accompanied by the pork was rich and earthy, almost like a mushroom and onion reduction. The star of the dish was the pork belly. Rich in fat, each bite melted in my mouth. It was sticky and gelatinous, and the flavor was perfect. Main: The pan seared Maine diver scallops were cooked perfectly. I always thought food came in odd numbers — 1, 3, 5. 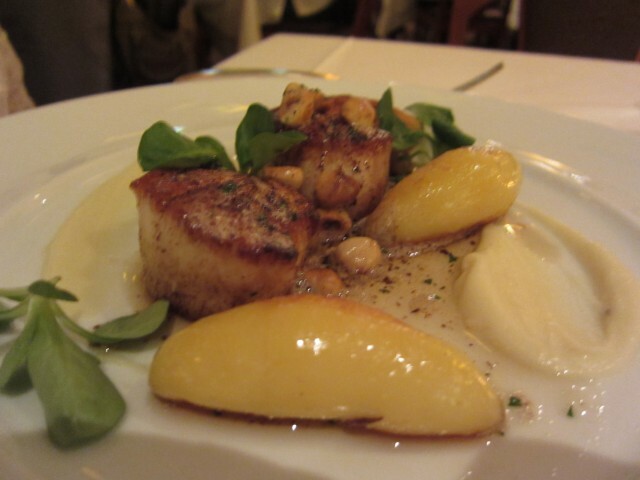 I was a bit confused when there were only 2 scallops on the plate. Either way, the scallops couldn’t have been better. It was nicely done inside and out, and had a silky, buttery texture. The confit fingerling potatoes, hazelnut brown butter, parsnip puree and mache salad all came together to make this dish very special. Dish wise, this one was better than the pork. Item wise, the pork belly took it. 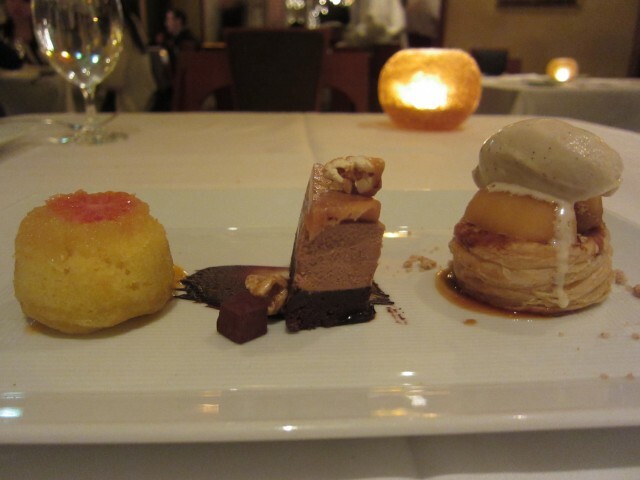 Dessert: The dessert came in a trio. Instead of picking one of the three, you got all three! 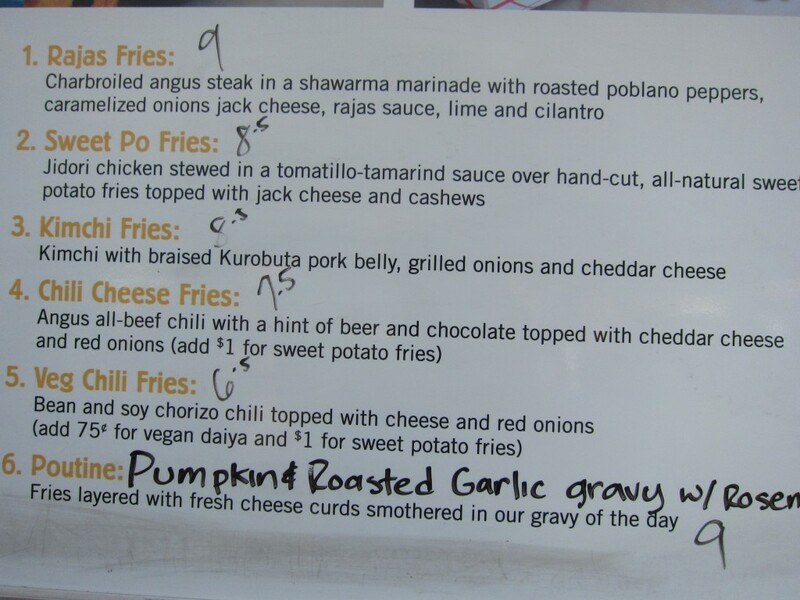 Though each item was small, it was nice to have tried all of them. The Candy Apple had honey poached fuji apples on top of a salted pretzel puff pastry. It was served with a Tahitian vanilla ice cream. The chocolate bar had a triple layer chocolate caramel cake. It was topped with crispy cracker jacks and chocolate caramel truffles. The sticky treacle upside-down cake had warm golden syrup toffee sauce and a thin slice of grapefruit. My favorite was the chocolate caramel cake. It was nice to see cracker jacks, an every man’s food, at such a non every man’s restaurant. You also can’t go wrong with chocolate. 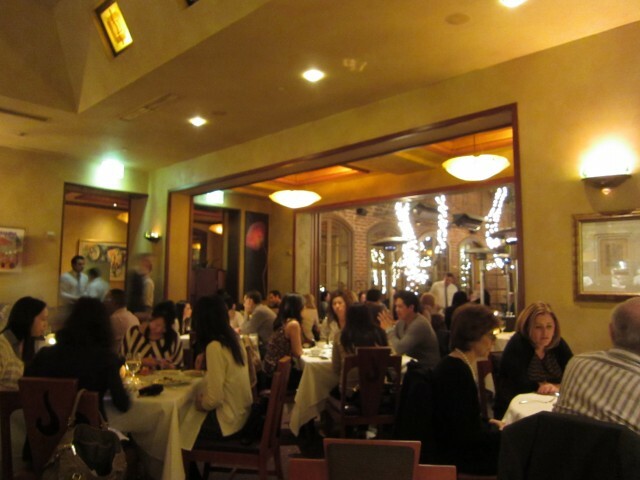 Spago’s Dine LA menu was wonderful. The food was classically prepared and the atmosphere was friendly. My meal was delicious, but will I remember it my whole life? Maybe, but I will remember this experience. I mentioned in the beginning that I will remember this time forever. That is because something out of the ordinary happened. After our dessert was finished, we waited for the check. The waitress came to our table and explained to us that our check was covered by the gentleman behind us! In shock, we just looked at each other with confusion. He didn’t leave a name or a card or anything. He was just an anonymous (though not quite) person who wanted to be generous. We are talking Spago here, not some free lunch or pizza — I’m sure our bill was pricey. Out of the goodness of his heart, he felt generous and paid for our meal, tip, tax and all. I think even the waitress was in shock as she didn’t quite know how to tell us. I was just lost for words. This stuff never happens to anyone. I kept asking myself who would do such a thing? We were truly blessed that night. It made me want to be a better man. I wanted to be generous. I guess good acts are indeed infectious. I did mention that the gentleman who paid for our check was anonymous. That is not quite true. As I was taking pictures from my seat, I did snap a picture behind me, as the kitchen was there. In that picture was that gentleman. Little did I know he would end up generously paying for our meal. The picture is a bit blurry, but he isn’t so anonymous after all. I chose not to share the picture because I’m sure he would have wanted to be left anonymous. If by chance you are reading this blog post sir, thank you for your generosity! And of course, thank you Spago for an unforgettable meal. As you may already know, I go to Disneyland more often than I should. And you probably already know that Disneyland has nothing good to eat. Seeking something good to eat, I had a chance to eat at Napa Rose, their most expensive restaurant on the property available to the public. 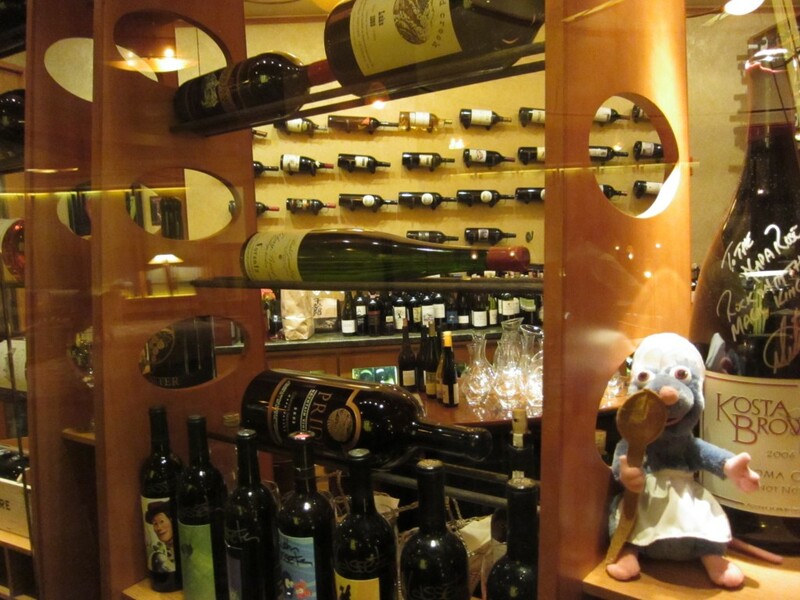 They are touted for their amazing wine selection and fine cuisine. It is definitely a step above the Blue Bayou — it doesn’t exude cheap pirrates and theme park rides. 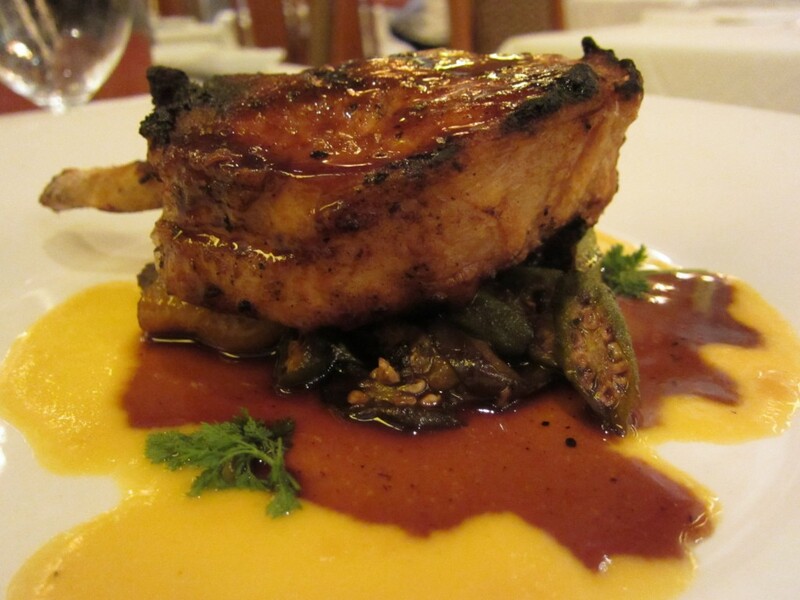 Napa Rose is classier, quieter, and the experience is just more like fine dining. We were given complimentary bread. 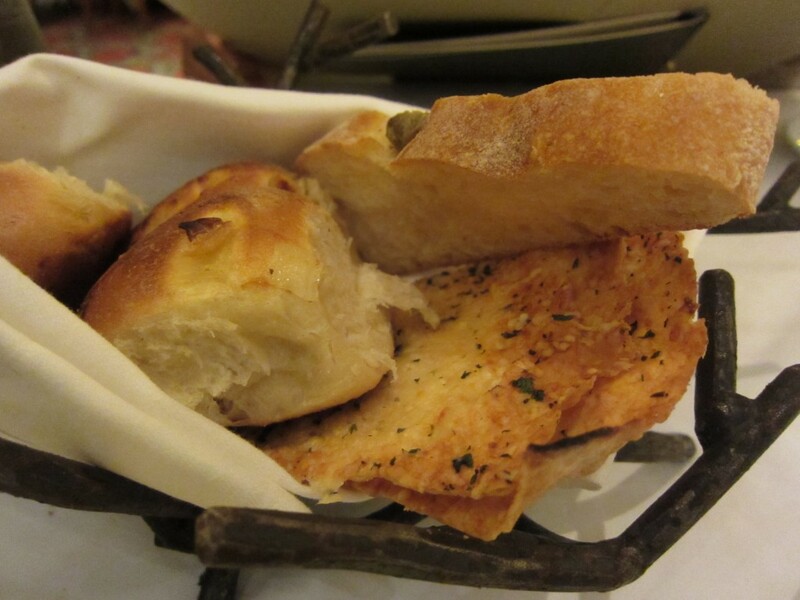 I like it when restaurants give you different kinds of bread to eat, not the same boring rolls or slices. 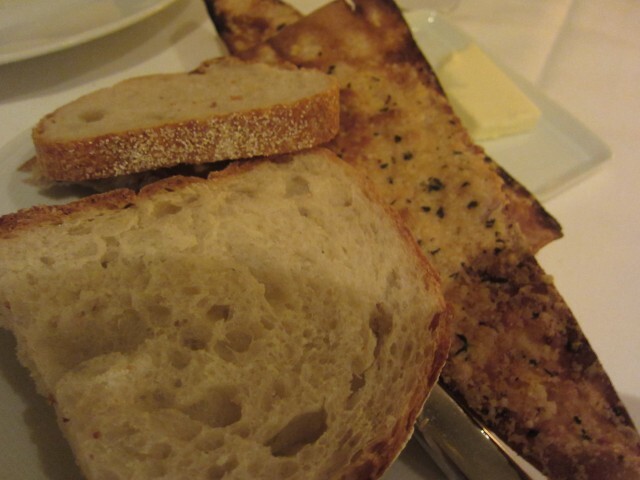 The parmasan crisps were really savory, and the bread was soft. It was a great starter. Other than the bread, we started off with the Smiling Tiger salad. This was a great start of the meal, and a very decadent and tasty salad. For one, it had tempura fried lobster. The lobster flavor was all packed inside the batter and it was crunchy and delicious. On the bottom had spicy beef, which was more of a marinated beef. The Asian greens mixed in with the coconut lime vinaigrette was tasty. A bit on the sweet side, but sour as well. This was a great salad with a lot of flavor. As we were waiting for our food, we were given portabello cream bisque in a tiny pot, compliments of the chef. 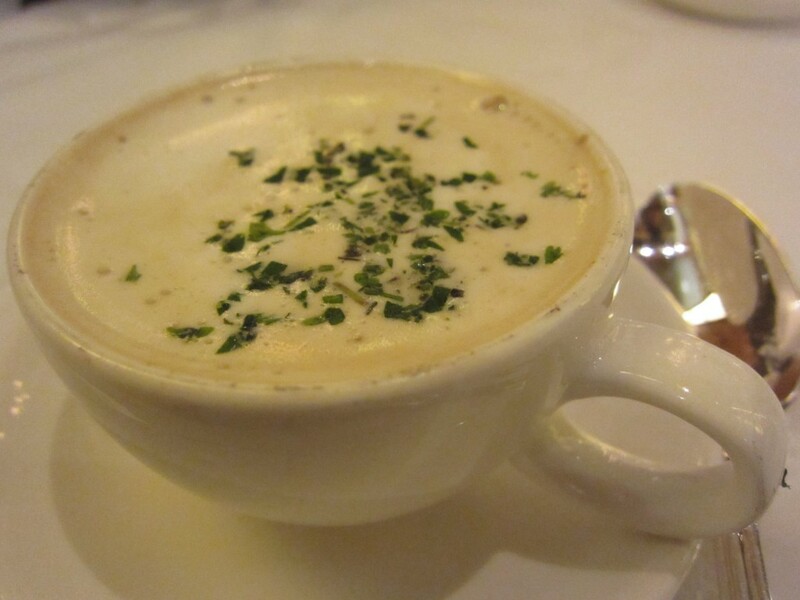 To our amazement, though the wait wasn’t that absurd, we enjoyed this soup. It was cream of mushroom, but obvious not from the can. It was rich in flavor and warmed the belly up. Service like this really makes eating meals so fulfilling. After that, we felt good. 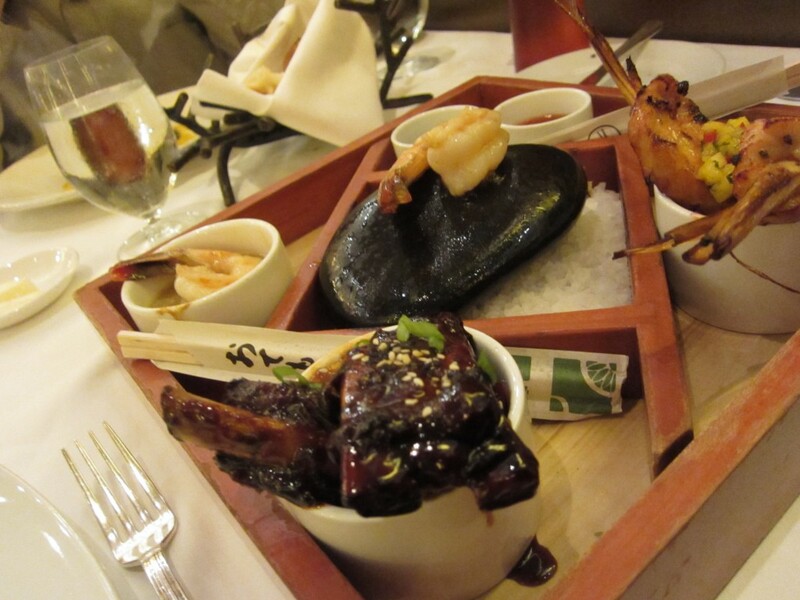 We wanted keep the Asian theme continuing from the smiling tiger, so we ordered the Sizzling Beach Rock — It was a a combination appetizer of garlic seared shrimp, soy glazed spare ribs, and lemon grass chicken skewers, and large tiger shrimp cooked on a hot beach stone. The appetizer was for sharing. the spare ribs and chicken skewers were kind of dry. My favorite were the garlic shrimp, though, the tiger shrimp on the beach rock was even better. All the little sharable appetizers was such an amazing thing to look at, as well as to eat. I ordered the grilled Kurobuta pork rack chop. This was a Berkshire pork chop stuffed with spanish chorizo on a rustic summer garden (okra) ragu. The pork chop was thick and the chorizo inside was amazing. Though some bites were kind of dry, the chorizo and ragu helped make each bite be juicier. Eating here, though not inside Disneyland, it still has some magic inside. The tall ceilings and masterfully designed interior really make this place special. They are all about service and good food. The wine selection is impressive and food is elegant. 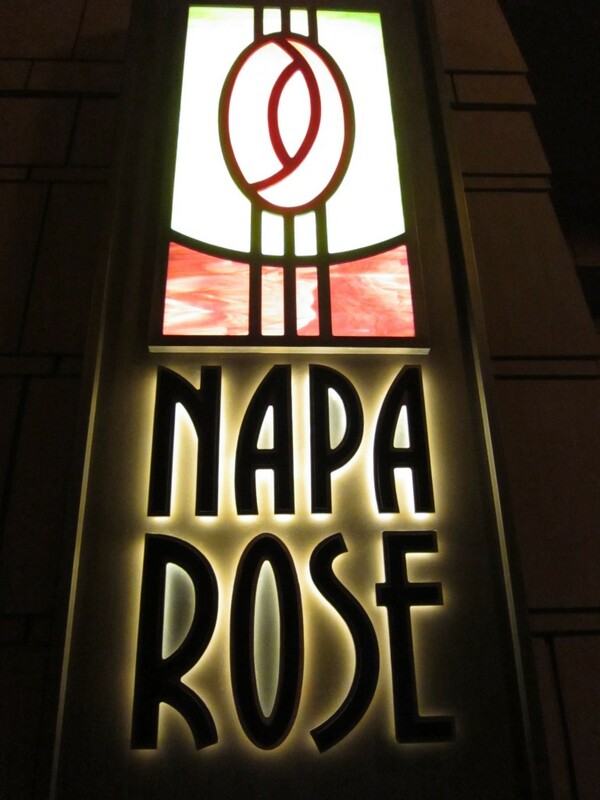 Napa Rose is a nice place to celebrate a special occasion, or maybe have a glass of wine. 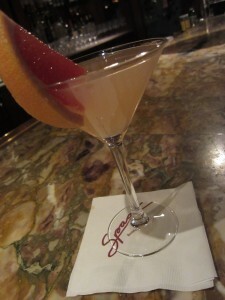 It has all of the whimsical and magical essences of Disneyland, but for adults. This may be one of my favorite restaurant chains. 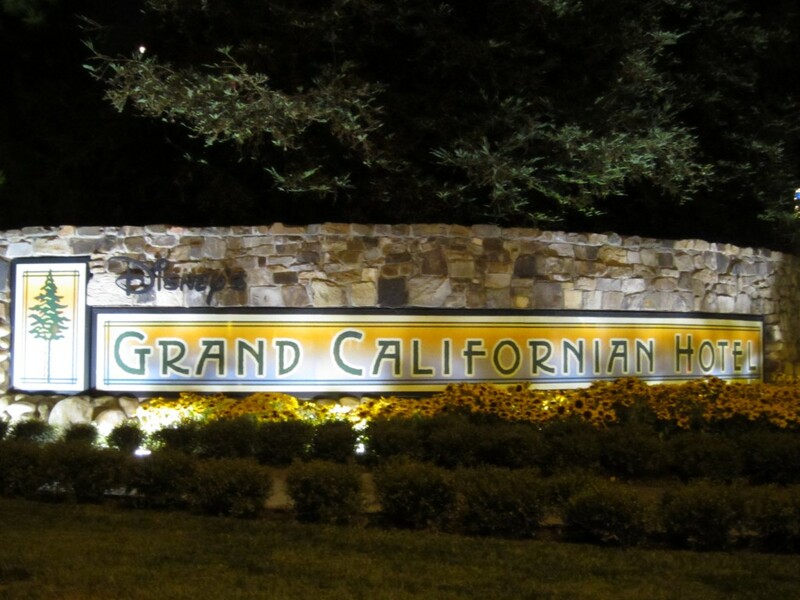 Houston’s offers a home feel with a bit of class and sophistication. It doesn’t try to be pretentious and is not image driven. They let the food speak for itself. It is a step above Yard House, which is a large step above TGIFriday. Though I didn’t really know what to expect, I was impressed with the food. We ordered the spicy tuna roll salad. On the menu, it said “inside out #1 tuna roll”. We didn’t know what the whole #1 thing was about, so I asked the waitor. Supposedly, that meant it was top grade tuna. 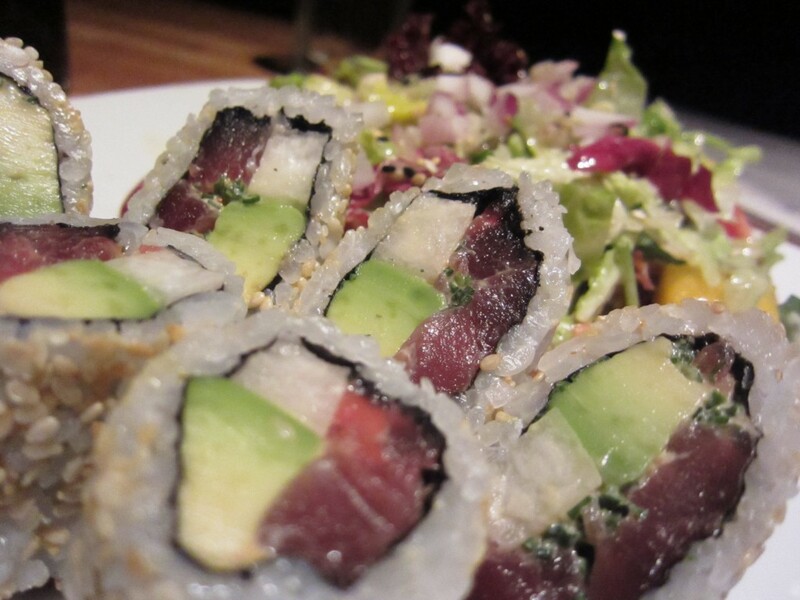 The tuna was indeed fresh and wrapped with greens avacado. I liked that the tuna was whole and not chopped up. Well, why would anyone chop up #1 tuna anyways? The mango and lettuce salad was a nice touch. The ponzu sauce was delicious with it. It looked too good to eat, but guess what — I did anyways. The Hawaiian ribeye is a sure thing here. 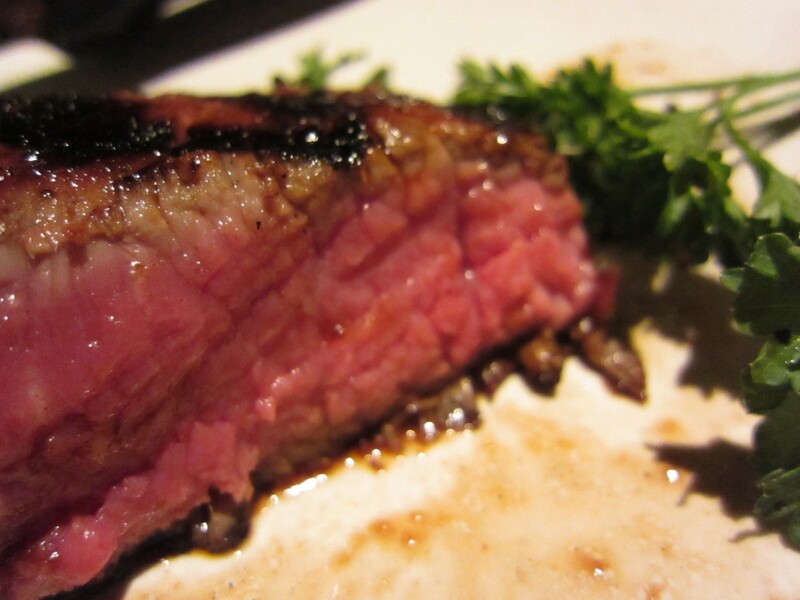 I like my steaks rare, and they cooked mine perfectly. 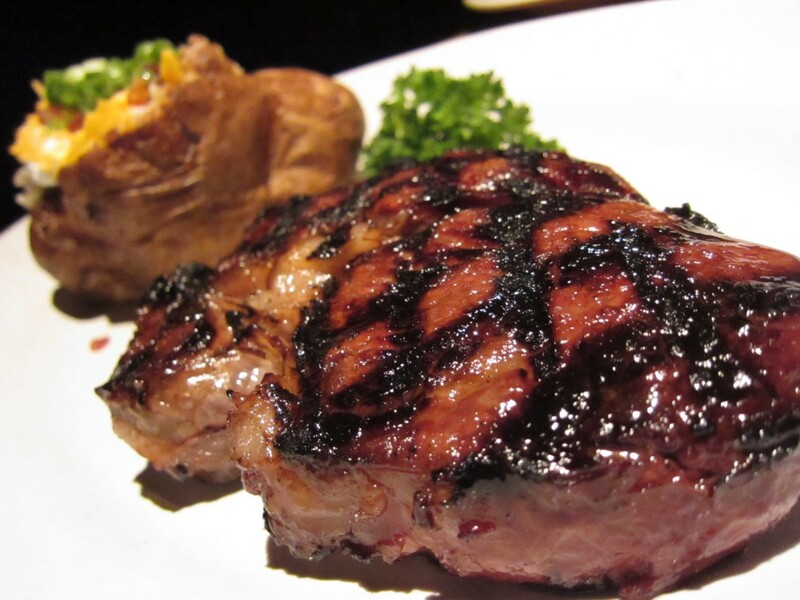 It is marinated in a subtly sweet sauce and the then grilled over hardwood. The taste was amazing. The sweetness was a nice change to a lot of steak I had in the past. It was juicy and had a perfect fat to meat ratio. The barbecue pork ribs were good as well. It had a nice sauce which is important to any BBQ dish. There was a lot of meat and flavor was definitely there, though a bit more meat would have been better — the ribs were kind of skimp. The best part of this dish was the cole slaw with parsley. It was such a simple side dish, but it made all the difference. 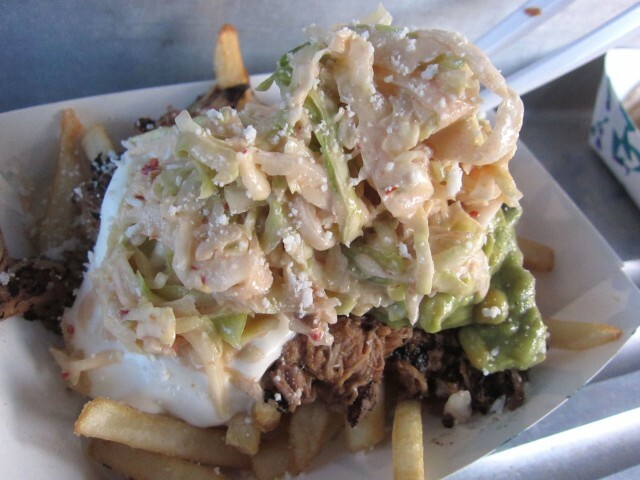 The crunch from the cabbage and chew from the meat was a great combination. Houson’s in Irvine was a great dinner. The atmosphere was friendly and sophisticated at the same time. Food was perfect. The price is a bit on the steep side, but you get what you pay for. In hind sight, it was worth it. I still dream about that ribeye.